There’s no denying the energy in Brian Innis’ voice these days. 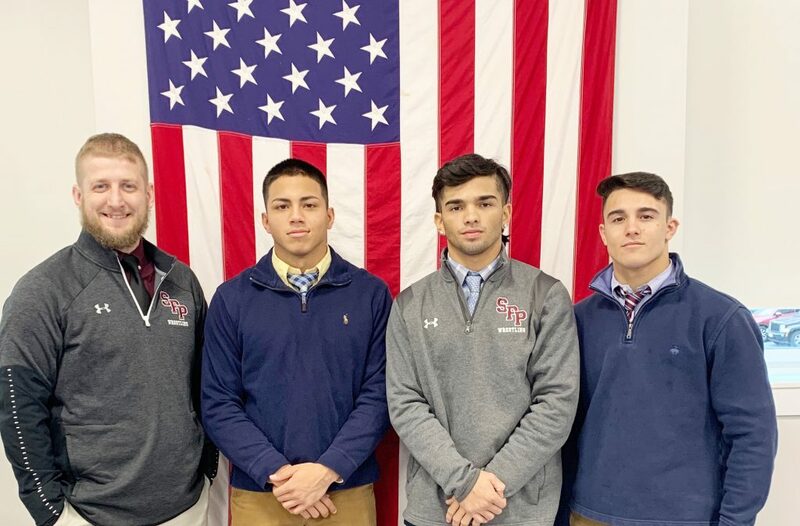 The head wrestling coach at St. Peter’s Prep is having the time of his life, despite the hectic schedule and an infant at home. The Marauders faced a little adversity in the trip to Florida. But the Marauders won all seven of their matches in Florida to come home with an unblemished record. The Marauders currently own an 11-1 record, after falling to Pope John of Sparta in a battle of two state-ranked teams, on Wednesday, Jan. 23. At 106 pounds is freshman Patrick Groo. At 113 pounds is another freshman Felix Lettini. At 120 is sophomore Pat Adams, who was the team’s 106 pounder last year. “He has an unorthodox style that makes him fun to watch,” Innis said. At 126 is sophomore Sean Rendeiro, who earned a trip to Atlantic City last year. “He’s a tough old-style wrestler,” Innis said. Alex Leon is a transfer from Secaucus who wrestles at 132 pounds. Junior Nick Gronda is the son of former Prep wrestler and football standout Rick Gronda who is holding fort at 138 pounds. Senior Julian Todd is the team’s 145-pounder. Todd is one of three team captains. “It’s tough to put a value on the amount of impact he’s made with our program,” Innis said. Senior Tommy Kellner is the team’s 152-pounder and another captain. Kellner is the last of three brothers who wrestled for Prep. “He’s been in our lineup since he was a freshman,” Innis said of Kellner. Freshman Roger Diaz is the team’s 160-pounder. He’s in a tough weight class for a freshman. James Cruz is the team’s mainstay at 170 pounds and the team’s best shot to earn a medal in Atlantic City next month. The senior Cruz won the District 13 championship last year. Senior Sean MacLaney missed all of last season with a shoulder injury, but has returned to the lineup this year. MacLaney is also a phenomenal rugby player with some scholarship offers in that sport. MacLaney wrestles at 182 pounds. Junior G.J. Mazzella is the team’s 195-pounder. Mazzella is a newcomer to the sport. Senior Niccolo Colucci is the Marauders’ mainstay at 220 pounds. Colucci, whose older brother Christian was a state champion for the Marauders and is currently on the wrestling team at Rutgers, has a good chance to earn a medal in Atlantic City. Niccolo Colucci won District 13 and finished second at Region 4 last year. Colucci was sixth at the prestigious Beast of the East tournament and was second at both Morris Knolls and West Orange tournaments. Senior Max Contreras is the team’s part-time heavyweight, but is being pushed by freshman Esquire Boyce. That’s the name of the day. Anyone named Esquire is a wrestler to watch. Needless to say, Innis is enjoying this team. As been a custom here for many years, the Super Bowl prediction is made in honor of one James “Alamo Jones Shoeless Roscoe” Gallagher, the retired Jersey City police officer, who was known for walking the beat on West Side Avenue for years, back when there were such things as beat cops. Crusty old Alamo is still the same after all these years and still loves his cigar and his football picks.